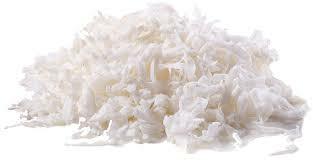 Shredded coconut adds flavour to a variety of foods such as cookies, soups and breakfast cereals, and supplies key vitamins and minerals. Coconut is a good source of iron. Iron is crucial for the formation of hemoglobin, which is the protein in red blood cells that is responsible for getting oxygen to each part of your body. Without enough iron, your cells don't get sufficient oxygen, which can lead to weakness and fatigue. You also need adequate amounts of iron to support your immune system. This 1 kilo bag is Certified Organic Shredded coconut which ensures pesticides and other preservatives have not used in the process of harvest. The lot number issued is L142770186.